To replace your gutters or not to replace your gutters, that is the question. What you may think to be simple or non-important issues with the gutters, could actually be huge warning signs that the drains do need to be replaced, and fast. If your gutters do need to be replaced, seamless gutter services are the way to go. Gutters are an essential component of any structure with a sloped roof. A properly installed gutter system collects the water and diverts it away from the structure. This is important because it keeps your foundation dry and sturdy. A framework that becomes damaged from leaking gutters or other causes can create a massive headache for you as well as cost you a ton of money. Encore Roofing provides the highest quality gutters in the industry with the use of the latest in seamless gutter technology. Our seamless gutters and seamless gutter services are an attractive and smart way to protect your home from the harmful effects of rain. When you use our professional staff of gutter installation specialists, you can rest assured that the gutters will work properly and will last for many years of use. You’re going to love your seamless gutters! We can perform most any gutter work that you require. Our services include not only the installing or repairing of the gutters, but correspondence from our team of gutter specialists in the event you have an additional service you require, or any questions involving the installation or repairs that were just performed on your home. When it comes to seamless gutter services, our clients are number one. Our goal is not only to meet but exceed our customer’s expectations. Our business has grown into the Colorado area’s most affordable and reliable roofing and gutter company for many reasons and our experienced staff, and fantastic customer reviews are a few of them. Trust is important in all aspects of life, and within our company, you will find that we are a trustworthy business that provides you with quality services at a fair and competitive price. We pride ourselves on our attention to detail, reputation, quality product, and services, as well as our excellent customer service. We assist you in correct seamless gutter services and the corresponding package that best fits your needs. When it comes to seamless gutter services, we are here to help you get the most out of your experience. Not only do we have knowledgeable staff, but we can also provide detailed consultations. Customers are encouraged to call to ask questions and consult with their gutter specialists. Whether you are looking for repair from clogged gutters, hail damage, improper drainage, water leaks, flashing issues, or any of our other services, we are ready to answer any questions you may have and provide you with exceptional customer service. If any problem were to arise, please call or stop in to discuss any issues large or small. We take great pride in our products and services, and we will take care of you! Encore Roofing is located in Littleton, Colorado. Colorado is a fabulous area with sunshine, mountains, and crisp morning air. These benefits to you can also be detrimental to your home’s gutters. The sunshine can discolor your gutters and leave them looking old and tarnished. The Mountain region is known for dumping a large amount of heavy, wet snow to the area blanketing your home while icing and clogging your gutters in a potential water leak. The crisp morning air can cause you to be chilled while working on your gutters outside your home, especially if you have gutters that are not sealed properly and leaking. In all these cases, our skilled team of repair technicians can troubleshoot to find the issue your gutters are having and correct the problem immediately. You are only a click away from the most trusted and reputable dealer of roofing and gutter services in Colorado and quite possibly in all the Mountain West area! 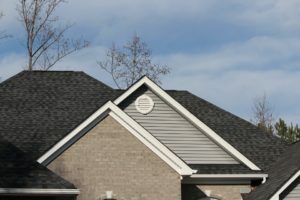 What is the difference between seamless gutters and sectional gutters? Sectional gutters are lengths of gutters that are cut and welded together to fit your needs; they are generally cheaper than seamless gutters. Seamless gutters are long sections that only connect at corners and downspouts; they are easier to maintain as you won’t have to check welds to make sure they haven’t broken. Encore Roofing provides quality products with low maintenance, lightweight structure, affordability, and modern style. Here in Colorado, we have found that customers want a quality product as well as a great experience in the process of repairing or replacing their gutters. We are truly able to provide this for our customers. We are a family owned and operated commercial and residential roofing and gutter business. We are not a corporate chain or a big box retailer. Being a small family owned and operated business allows us to focus our time and attention on you, rather than on budgets and bureaucracy. With a family owned and operated business, you get a great reputation and fantastic customer service among multiple other benefits.